Even though they failed to trade Mike Lowell, that didn’t prevent the Red Sox from picking up their next third baseman. According to a baseball source, Adrian Beltre has agreed to terms with the Sox on a one-year deal, with a player option for a second year, to take over the starting job. Beltre’s decision came down to a couple of West Coast teams (reportedly the Angels and A’s) and the Sox, but Boston won out at a price far lower than agent Scott Boras had anticipated at the start of the offseason. Peter Gammons of the MLB Network reported the contract was for $9 million, with the option worth $5 million. It also has been reported there is a $1 million buyout of the deal. The contract is contingent on a physical. Despite general manager Theo Epstein and manager Terry Francona’s insistence that the team would be comfortable entering the season with Casey Kotchman as the first baseman, that won’t come to pass, as Kevin Youkilis will stay at first. The Sox instead went out and added the best third baseman on the market, picking up a player who hit 48 home runs with the Dodgers in 2004. However, he never has hit more than 26 homers in any other season. The move is in line with the Sox’ stated desire to improve their run prevention. Beltre is an above average fielder, earning a 14.3 ultimate zone rating according to fangraphs.com. Contrast that with Lowell’s minus 10.4 UZR (or just ask a scout), and it’s clear the Sox have dramatically upgraded their defense at the position for 2010 and possibly beyond. Adding Beltre to the infield, Mike Cameron to the outfield, and John Lackey to the starting rotation were all moves based on Epstein’s dissatisfaction with the team’s defense in 2009. While the offense hasn’t exactly been upgraded, and most likely took a step back with the subtraction of left fielder Jason Bay, Ep stein and the Sox clearly believe the changes to their defense and rotation will negate the inconsistency the Sox offense struggled with in 2009. After beginning his career with the Dodgers, reaching the majors at 19 years old, Beltre spent the past five seasons with the Mariners. 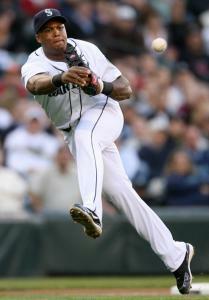 In Seattle, Beltre had a batting average of .266 with a .317 on-base percentage. He hit 103 homers and drove in 396 runs in those seasons, including a 2009 campaign shortened to 111 games by injuries to his shoulder and testicle. The signing further confirms that the Sox have soured significantly on the ability of Lowell to play consistently. After the Sox nearly traded him to Texas for backup catcher Max Ramirez (and agreed to eat $9 million of his $12 million deal), Lowell had surgery to repair his thumb in December. While the Sox have said Lowell will be recovered by the beginning of spring training, that has not made them any more eager to have him play a significant role. According to a major league source, Lowell will stay on the trading block through spring training. It remains to be seen whether any team will take a chance on the third baseman, who will turn 36 in February, given how much the Sox have devalued him this offseason. Beltre is coming off a five-year, $64 million deal with Seattle. The Mariners offered him salary arbitration, but he declined. Beltre was a Type B free agent. The Sox already have signed two Type A free agents in Lackey and shortstop Marco Scutaro. Peter Abraham of the Globe staff contributed to this report. Amalie Benjamin can be reached at abenjamin@globe.com.